D2 Dental believes in changing not only peoples smiles, but peoples lives! Using the best materials on the market, we provide only the highest quality dental care in all branches of dentistry. Our standard of excellence in personalized dental care enables us to help you achieve your optimal dental health. 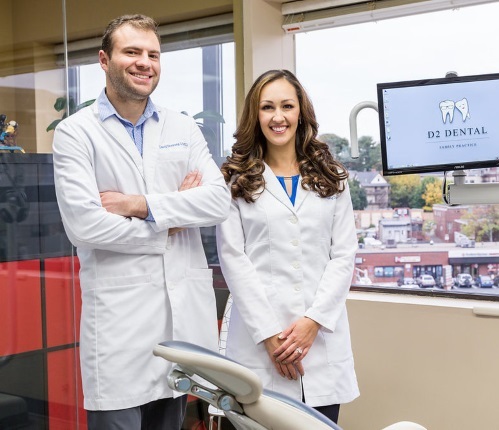 Here at D2 Dental, we believe that every person can achieve optimal dental health. Our knowledgeable team will help you not only address, but understand the issues you may be experiencing and to prevent them from occurring in the future. 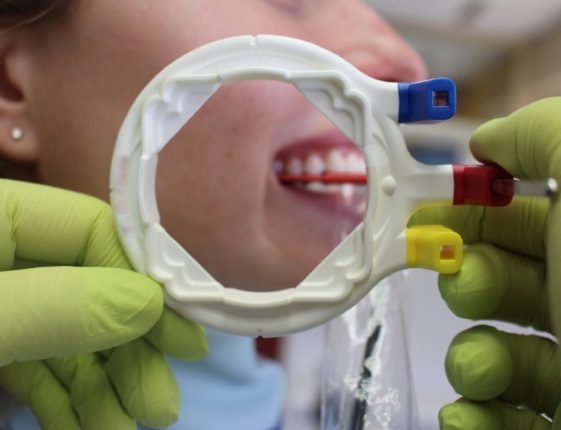 We believe in teaching every patient about their oral health, as much as they wish to learn. With the help of digital x-ray systems and intra-oral cameras, we will make sure you understand everything we recommend and why. No question is ever too silly or too long- we take pride in educating our patients! If you have a specific issue you would like us to address, we will gladly do so, but we always recommend looking at the bigger picture and addressing the whole mouth. Everything in the body is connected, as it is in the mouth. A missing tooth on the lower jaw, could cause the opposite tooth on the upper to super-erupt (drop) and may eventually lead to additional extractions. If the gums are swollen and bleeding, resulting dental dental work may not have as good a long term prognosis because the jawbone and gums are the foundation of the teeth. 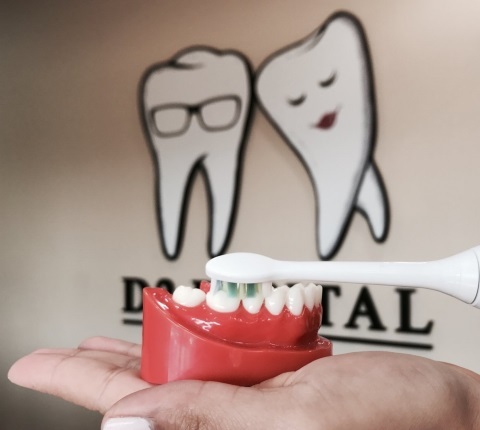 During your first visit you will get a thorough cleaning, your gums will be measured for “pockets” to make sure you're not at risk of periodontal disease, your radiographs (dental x-rays) will be taken and reviewed with you by the doctor. The doctor will screen you for oral cancer and any potential lesions/abnormalities. If there are issues/questions, intra oral photos will be taken and reviewed with you. A treatment plan will be created and Carolina or Emily will go over it with you in detail at the end of your appointment. If you are interested in whitening and/or Invisalign to straighten your teeth, options will be reviewed with you. And lastly, the doctor and the hygienist will answer any questions you may have. We look forward to meeting you! 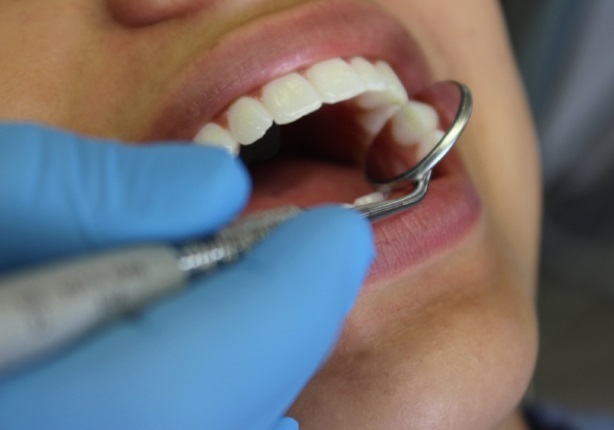 A dental cleaning is a preventative procedure performed by a dental hygienist. Even if a person brushes and flosses daily, there is usually build up of plaque and bacteria that happens in certain "hard to reach" spots. When that build up calcifies, calculus is formed, which could no longer be removed by a toothbrush alone and requires removal using specialized dental tools. It's recommended that everyone gets a professional dental cleaning every 6 months and every 3 months if you have periodontal disease. Flouride is a natural occurring mineral that plays a big role in strengthening our enamel (the outer coating of our teeth). Our enamel is in constant state of demineralization and re-mineralization. When you eat something acidic or sugary, the acid present in food or produced by the bacteria that are present your mouth, de-mineralize that enamel. Demineralized enamel is weak and allows bacteria to get inside the tooth. Weakend enamel can chip off, causing a piece of your tooth to break off. One of the ways to help prevent this from happening, along with frequent brushing and flossing, is topical application of Flouride to your teeth. Think of Flouride like vitamins for your teeth. The mineral gets incorporated into the weakened enamel, making is stronger and less susceptible to damage. 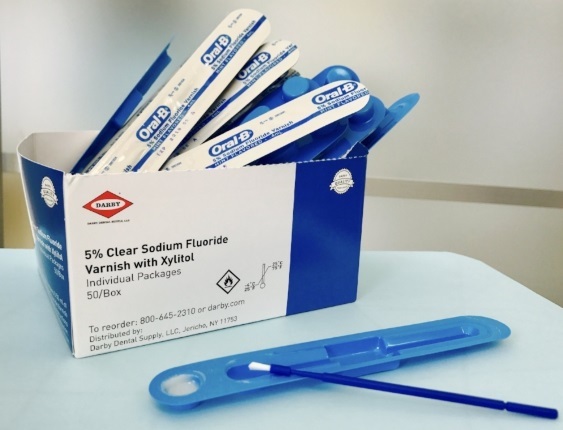 You may remember getting flouride treatments (either tray and gel or topical varnish) at the dental office when you were a kid. We recommend a flouride varnish every 6 months for all adults and children to prevent cavities. Some people who have an extremely high caries risk, may require prescription toothpaste and rinses with extra flouride. Let's talk about keeping those teeth healthy and clean. We recommend brushing twice per day, and flossing once, at the very least! Flossing and brushing, ideally, should be done after every meal. If you cannot do it after every meal, we recommend brushing for 2 minutes during the morning, flossing and then brushing for 2 minutes after dinner right before bedtime. Make sure you don't eat anything after you floss and brush at night, otherwise the food will just sit between and on your teeth the whole night! Your oral bacteria will be very happy to have food for the night, as a bi-product lactic acid will be formed which will decalcify your teeth, causing cavities and bacteria will multiply causing bad breath. We recommend an electric toothbrush, as it cleans your teeth 10x better than the manual one. Also, chances are you are only brushing for 30 seconds or so with a manual, while an electric has a 2 minute timer and it will even tell you when to switch to the next quadrant of your mouth. Sonicare is our favorite brand, but Oral B is also good. Most people brush too hard, so what we like about sonicare is it has a pressure sensor and it will alert you when you are pressing too hard and prevent you from damaging your gums causing recession and tooth sensitivity. Whichever toothbrush you choose, we recommend to use a soft head only. Remember, its not how hard you brush, but the length and frequency that makes a difference. We recommend taking dental radiographs once per year in order to diagnose any potential cavities, infection or bone abnormalities. We only use digital radiography, which is the lowest radiation dose of all medical x-rays. A yearly x-ray exam, which uses 4 bitewing films and 2 periapical films is only 0.012 mSv, which is less radiation than what a person gets in one day from natural background radiation or equivalent to a 1-2 hour flight on an airplane. Let's start with why you may need a filling. Maybe you have extremely deep grooves in your teeth, to the bottom of which, toothbrush bristles are unable to reach and did not have protective sealants to protect those grooves from bacteria. Or perhaps you have not been flossing as often as you should? Or maybe you like to snack all day long? There are many different factors that can lead to tooth decay. For most of us, it's a combination of factors. There is no judgment here at D2 Dental, all we want, is to help you be cavity free! Cavity, a.k.a. caries/decay, is formed when bacteria which is present in your mouth all the time, comes in contact with the food that you eat. Acid is produced as a byproduct and starts weakening and destroying your tooth structure. When you have a cavity, a dentist will get you numb, making sure to eliminate discomfort. Then, a small bur is used to remove only the affected tooth structure and the bacteria underneath. White (resin composite) filling material which bonds to the tooth, is used to fill in the missing tooth structure. It's then shaped and polished to make it look and feel like a new tooth again! Brush, floss and brush some more (but not too hard). Yes, the best way to prevent the acid from forming, is to decrease the number of bacteria in your mouth. Unfortunately, no matter how much your brush, floss or mouthwash them away, you will never get rid of all bacteria. The key is not to let the bacterial colonies grow out of control and limit the available nutrients that they thrive on. Brushing for at least 2 minutes in the morning and for 2 minutes in the evening after flossing, will do the trick. If you want to ensure zero cavities, floss and brush after EVERY meal, but we all know it may not be realistic for most people, so set goals for yourself that you can follow. Remember, it's not how HARD you brush, it's how OFTEN and for how LONG. Limiting sugar and snacking will help a lot as well. How WE can help you prevent it? Coming in every 6 month for cleanings (every 3 months if you have been diagnosed with periodontal disease) will allow us to remove all that sticky bacterial colonies called plaque, that may be too big and too sticky for you to remove by brushing alone. We also recommend topical fluoride treatments. (see Fluoride tab to read more about Fluoride). Your Child's first Dental visit! Did you know that The America's Dental Association and the American Academy of Pediatric Dentistry recommends that the your baby's first dental visit should occur within six months after the first tooth appears, but no later than your child's first birthday? Baby teeth are extremely important to your child's health and development. They hold space for adult teeth that are developing under the gums and will start erupting around 6 years of age. If a baby tooth is lost prematurely due to decay or infection, the permanent teeth will not erupt in the right place and will drift into empty spaces. This could lead to a variety of problems, such as crooked and crowded teeth, which is turn could contribute to periodontal disease. That's why it's so important to start brushing your child's teeth as soon as they erupt. It's a good idea to start wiping your baby's gums with gauze as soon as they are born, in order to get them used to cleaning that part of the mouth. As soon as they get their first tooth, which happens around 6 months of age, it's recommended to visit a dentist. Having a child's first dental visit early, will get them used to the dental chair and prevent "fear of the dentist" in the future. Your dentist will also teach you how to properly clean your baby's teeth and help deal with bad habits, like thumb sucking. In the same way that pediatricians are trained to meet a child's medical needs, our pediatric dental specialist is uniquely qualified to protect your child's oral health using the most advanced techniques, and all in our delightfully friendly family practice in Malden Square. Pediatric dentists have an additional two to three years of training at university pediatric facilities in addition to four years of dental school and four years of college study. They master how to deal with the behavioral aspects of children, how to make them feel comfortable, making their experience pleasant. They are also trained and qualified to treat special needs patients. Simply put, a Pedodontist has the finesse to treat children. 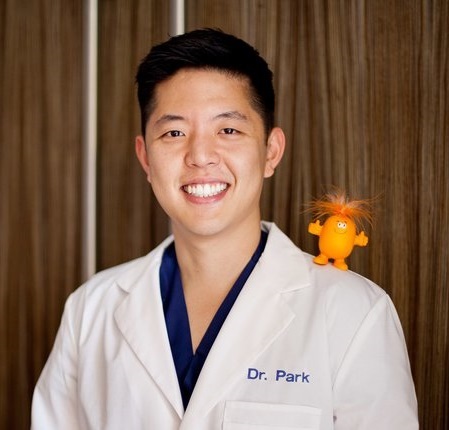 Our Pedodontist, Dr Hubert Park, works on some Saturdays to make it more convenient for parents to be present during their child's dental visits. *Our Pediatric Specialist is affiliated with the Mass General Hospital and is able to arrange and provide treatment under general anesthesia, if needed.